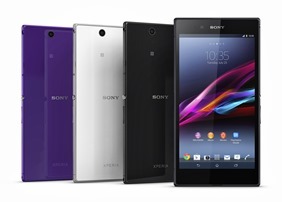 Sony is getting into the plus-sized phone game in a big way. Today they've officially announced the Xperia Z Ultra, a super-sized handset that follows the design principles of the original Xperia Z. Nearly all the specifications (with the exception of the camera) have been boosted over the current Sony flagship, starting with a downright massive 6.44-inch 1080p screen. Other highlights include a Snapdragon 800 quad-core processor clocked at 2.2Ghz, (labeled as "the world's fastest") a super-slim 6.5mm body, and a water- and dust-resistant design. The screen is definitely the star of the show here. Sony calls it a TRILUMINOUS Display, incorporating technology from the Bravia television line, including the X-Reality video-enhancing software. The idea is that the screen will actively analyze video and reproduce lacking pixels in a sharper and more vivid way. Obviously we can't comment on the efficacy of these claims, but it's safe to say that those who love enormous screens will be well-served by the Xperia Z Ultra. 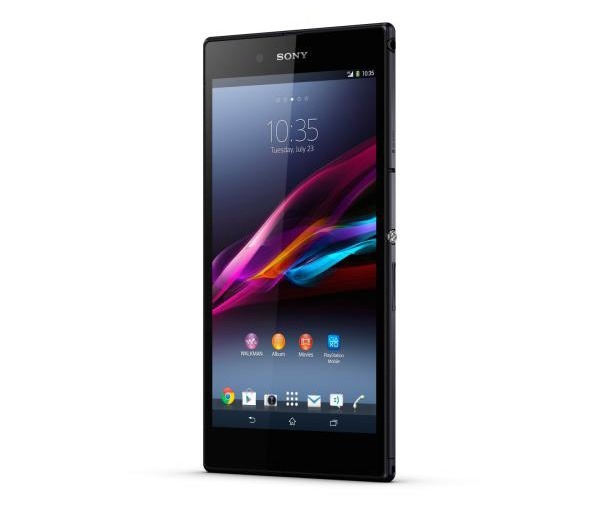 That unbelievably slim body is built with the same layout and visual cues as the Xperia Z and Xperia Tablet Z, including tempered glass on both sides and the power button mounted on the center of the right edge of the device. 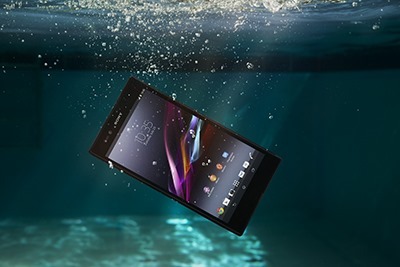 The frame is metal, giving the phone more strength than one might think - it's also rated IP55 waterproof, which means that it can handle 1.5 meters of liquid submersion for up to 30 minutes. It's reasonably resistant to dust and other small particles. Sony will offer the phone in black, white, and purple colors. Storage will be offered at 16GB, with a MicroSD card slot accessible to the user. That's a bit on the low side for a flagship device. The battery, on the other hand, is a quite respectable 3000mAh, though that screen will definitely eat it up faster than more conventional phones. Sony claims that the Xperia Z Ultra will get up to 11 hours of talk time, 5.5 hours of video playback, and a whopping 120 hours of audio playback. Sony attributes this to its STAMINA system. 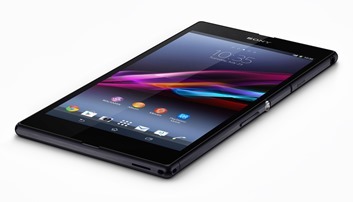 The phone's software is Sony's customized version of Android 4.2. The only downside to the phone is a somewhat dated 8-megapixel rear camera, which is fine, but compares poorly to the 13.1 megapixel shooter on the Xperia Z and other high-end smartphones as of late. The reason for this apparent downgrade isn't clear - perhaps Sony couldn't get a bigger sensor in that slim body? In any case, the phone will include HDR modes for video and stills. The front-facing camera is 2MP. 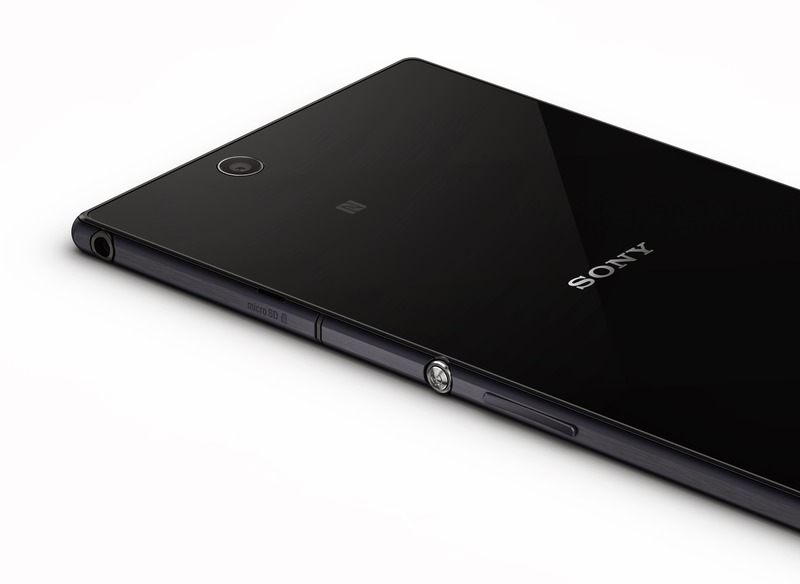 Update: As some of our commenters have noted, there appears to be no LED flash for the Xperia Z Ultra's rear-mounted camera. Other sites that have had hands-on looks at the Mobile Asia Expo have confirmed this. It's a baffling omission on what's otherwise an ultra-premium device. 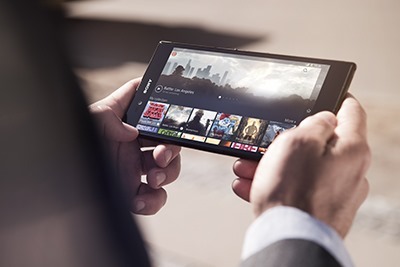 Xperia Z Ultra features a 6.4” touchscreen Full HD display with Sony’s unique TRILUMINOS® Display for mobile, creating a wider palette of rich natural colours thanks to Sony’s BRAVIA TV expertise. The breakthrough technology includes X-Reality™ for mobile - Sony’s intelligent super resolution display technology which analyzes each image and reproduces lacking pixels to optimize quality for the sharpest videos. It analyses elements depending on the scene and adjusts them based on pattern, outline and colour composition. It also strengthens subtle patterns and accurately portrays their detailed feel, as well as reinforcing bold outlines. The large Full HD display has been optimised to experience at least 60%*** more of the screen than most other smartphones. The only waterproof Full HD smartphone** Xperia Z Ultra is both elegant and durable. With an impressive rating of IP55 and IP58, this smartphone isn’t only resistant to dust, but is waterproof** too – giving you the freedom to enjoy it anywhere. You can even film in Full HD underwater, taking your large-screen smartphone experience to a new level. The camera features “Exmor RS for mobile”, HDR for both photos and film, and Superior Auto mode automatically activates HDR and noise reduction when needed, so you’ll get stunning imagery even in challenging light conditions. 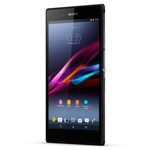 The Xperia Z Ultra features the world’s fastest smartphone processor**** - the Qualcomm Snapdragon 800 processor with HD voice, that together with Sony´s audio Sony’s ClearAudio+ mode and Xloud loudness enhancement, delivers not just exceptional speed and performance, but also unsurpassed voice and audio quality. Battery STAMINA Mode significantly improves the standby time of your smartphone by four times or more1 as it recognises when you’re not using your display and automatically turns off the functions you don’t need, while keeping the notifications you want. As soon as you press the power button to wake up your screen, everything is up and running again.